For now, the UK’s departure date is still written in to law as next Friday, 29 March. But Mrs May is expected to change that by tabling legislation next week and getting it through the Commons and the Lords before then. 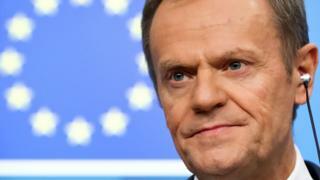 The withdrawal deal sets out the terms of the UK’s departure from the bloc, including the “divorce bill”, the transition period, citizens’ rights and the controversial “backstop” arrangements, aimed at preventing a return to border checks between Northern Ireland and the Republic of Ireland. Business Secretary Greg Clark told the BBC that if they do not back it, then the government would give Parliament the means to express their views on a series of other options – to determine which would get MPs’ backing, known as “indicative votes”. But Nigel Dodds, deputy leader of the DUP – whose votes Mrs May relies on to support her minority government – said the prime minister had “missed an opportunity” to propose changes to the withdrawal agreement to help get it through the Commons. “The prime minister has now agreed with the EU to kick the can down the road for another two weeks and humiliatingly revoke her oft-stated pledge that the UK would leave the EU on 29 March,” he said.